Of these nine offices, CRA failed to endorse in the following races: Controller, Insurance Commissioner, and, Superintendent of Public Instruction. Thus CRA ceded one third of the races. Of these three, the Controller race has a registered Republican that made it to November with no help from CRA; recovering Republican Steve Poizner came in first for Insurance Commissioner; and Superintendent of Public Instruction did not indicate party on the ballot so I don’t know who they were. The implications of this inaction is that we must conclude that CRA doesn’t care about California. Look at what each of these offices do. First, Betty Yee is arguably the worst incumbent on the ballot. Yes, even worse that Garvin Newsom. Her track record is terrible and in my opinion, she is the worst Controller that California has seen in decades. The backbone of California’s financial records system is a UNIX based program called CalSTARS that was implemented last time Jerry Brown was Governor back in 1983. Yeah, this is the program that caused the Y2K crisis in California. Millions were spent to pay retired state employees to return to work to patch this P.O.S. so it could handle four digit years. For many documents that her office processes, SCO has a backlog to 2015. Under her leadership—or lack thereof—the Controller’s Office is slower and less efficient in a state that thinks it is the technology leader of the world. Can you say Irony? Oh, her Agency still uses tractor-feed paper and dot-matrix printers to give documents to various departments because they aren’t available in digital formats. I could go on but the thing that should really frost not only CRA but all Californians is that Betty Yee and Fiona Ma—the Treasurer candidate—are personally responsible for the disinformation campaign that dismantled the Board of Equalization last year. Since CRA’s current President, Tom Hudson, worked for BOE, I would think it a slam-dunk that CRA had a candidate they could support to “take-out” Yee but no dice. Like everything else under Hudson’s leadership, all you get from CRA is crickets. You would think that Hudson, Sue Blake, George Runner and the other so-call Republican stalwarts would stand-up for themselves and their livelihoods even if they won’t stand-up for the taxpayers that they claim to represent at BOE. Democrats threw the token black guy (one of their own) under the bus and all you got was crickets. CRA claims they hate Obamacare. We all know that Obamacare was a stopgap solution on the socialist road to single payer healthcare. So did CRA run or endorse anybody that is running for Insurance Commissioner? Heck No! Once again, their rhetoric and their actions don’t agree. CRA has had many opportunities to change their endorsement process to conform to the “Jungle Primary” system that we have in California. They have refused to face the reality that not every race will have a Republican in it. At my last CRA convention (you know the one where they overwhelmingly endorsed Lyin’ Ted), I brought the issue before the convention and they killed it at the earliest opportunity. In his Republican days, Poizner was a CRA endorsed candidate but in a race with no Republican, CRA didn’t have the guts to go with him when he clearly is the best guy on the ballot. At my last CRA Convention, much energy was spent bashing Common Core but again CRA has no dog in the hunt for this job; somehow I don’t think it’s because they figured-out that in California, Common Core is here to stay. CRA did actually hit two winners in the statewide offices. For Secretary of State, Mark P. Meuser, came in second. For Attorney General, Steven C Bailey also came in second. If the June results are any indicator, both Republicans will face the slaughter in November. Sadly, this brings us to the third act of the CRA train wreck. CRA had four big misses in the endorsement department. Governor, Lieutenant Governor, Treasurer, and US Senate. Before I get into the details, I know some will try to nitpick what I’m about to say so in the interest of full disclosure, the numbers used below are from the Secretary of State’s website on June 12, 2018. At Convention, CRA spent much time debating the pool of potential candidates and threw their weight behind Travis Allen. Meanwhile, their arch enemy, Donald J Trump, threw his support to John Cox. From the votes tallied thus far, Cox received 25.8 percent of the votes cast while CRA’s all-star candidate received 9.55 percent. Trump’s guy got about three times the number of votes. Oh, Allen came in fourth place in the race while Trump’s guy will be on the ballot in November. Since the jungle primary was implemented, this is the first time a Republican gubernatorial candidate has made it to November. For that we have Donald Trump to thank not CRA. 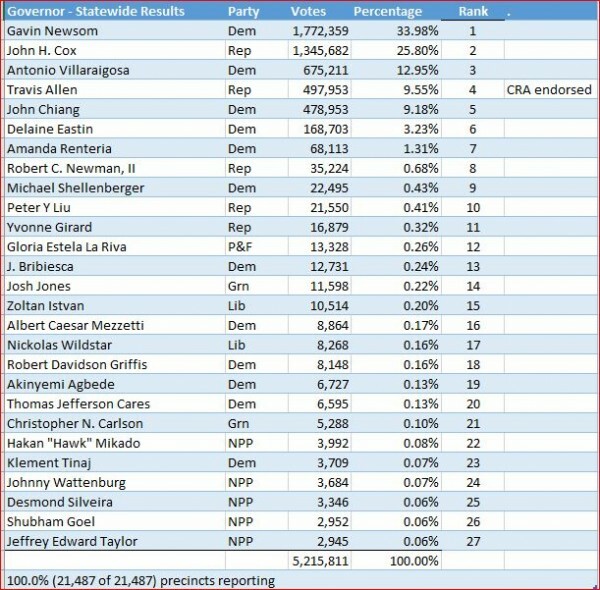 CRA fared even worse in their choice for governor in waiting. Their choice was David Hernandez. Hernandez received 6.1 percent of the vote. 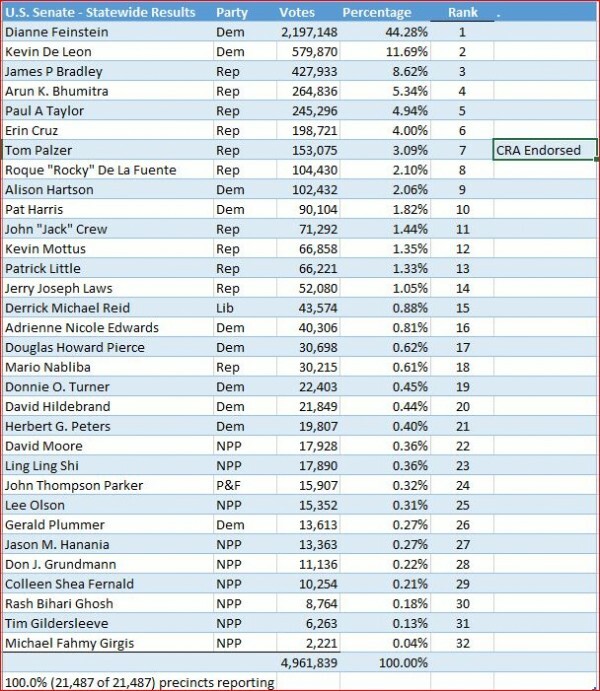 Out of four republicans on the ballot, CRA’s anointed came in fourth. My prolife Facebook friends said to go with Cole Harris who ended up being the top Republican vote getter. Sadly, Harris was beat by two Dems so he won’t be going to November. Oh, CRA’s guy came in seventh place. CRA had a chance to go after Fiona Ma with their choice of a Treasurer candidate. They picked Jack Guerrero. Jack apparently didn’t know jack and came in third place. He was bested by Ma and Republican Greg Conlon. From a Conservative Republican point of view, if any candidate on the ballot embodies the opposite of what is good, right, and Constitutional it is Dianne Feinstein. Surely CRA had a guy to go after the ancient Senator from San Francisco. Charged with this task at their Spring Convention was the noble Tom Palzer. In a field of 32 candidates, surely the CRA endorsement would be decisive in propelling a solid Republican to the head of the pack. 11 of the candidates were Republicans. Among Republicans, Palzer placed a solid fifth place thanks to CRA. Sadly, he came in seventh place overall with 3.09 percent of the statewide total. CRA is a lost and irrelevant organization. In my mind, their “jump the shark moment” was the endorsement of Ted Cruz. Their vote of over eighty percent endorsing Ted Cruz on the first ballot proves that they are out of touch with rank-and-file Republicans. They are bleeding membership and still have many paper clubs in their midst. Tom Hudson was supposed to be a caretaker President to heal the organization and provide stability and integrity. Instead, he is the undertaker President leading the group into the wilderness to atrophy and die. They should either pull the plug on the organization or hand it over to Johnnie Morgan and his group in LA. Either way, the current leadership needs to walk away now.